Posted in: BSU Journal Club. Tagged: close-in exoplanets, exoplanets, TESS Mission. At our journal club last week, we discussed the discovery of a new warm Jupiter from the TESS Mission. 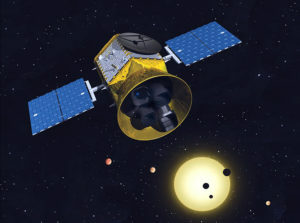 TESS is the successor to the wildly successful Kepler/K2 Mission and is designed to find exoplanets using the same technique as Kepler – looking for their shadows as planets pass in front of their host stars, i.e. the transit technique. Sadly, the Kepler spacecraft was officially shut down two weeks ag0 because it ran out of fuel, but TESS, launched last March, is off and running, having already discovered about half a dozen new planets. One of those planets, we discussed in journal club on Friday – a planet orbiting the star HD1397. The gas giant planet is about the same size as Jupiter but half the mass, making it significantly less dense than Saturn. The planet also has an unusually eccentric or stretched-out orbit that swings very near its host star, passing to within 8 stellar radii from its star at its closest point. By contrast, the Earth is 200 stellar radii away from the Sun. If this planet had been discovered 20 years ago, it would have completely stumped astrophysicists, and many would likely have doubted its existence. Nowadays, though, such strange planets are practically the norm in exoplanet astronomy. So with HD1397 b’s discovery, the exoplanet train rumbles on, and we should expect thousands upon thousands more bizzarities from TESS that will, like Kepler’s discoveries, again re-write the planetary rulebook. At our research group meeting, we also discussed the art of scientific presentations. I’ve pasted the example presentation I gave below.